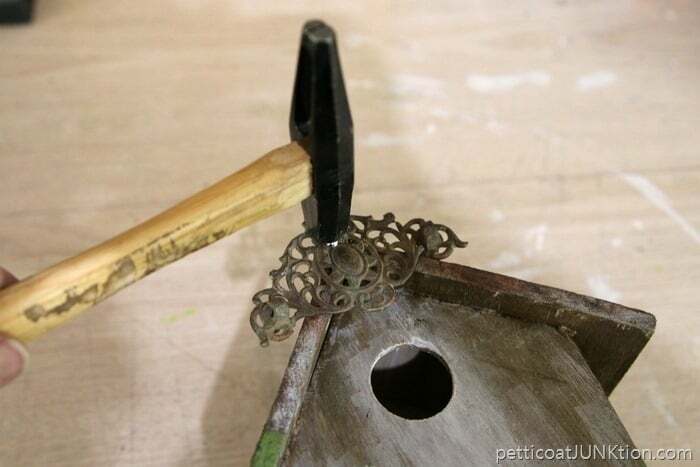 I like to add charm to a wood birdhouse with bits of rusty junk and vintage hardware. No plain old plain old here. I also did a special paint technique on this wood birdhouse and it is sure pretty. Makes me do the happy dance. How are you guys? Did you notice I only had 2 posts last week? The hubby and I were on vacation. I didn’t have time to write and schedule 4 posts before we left town…..only two. No blogging on vacation. 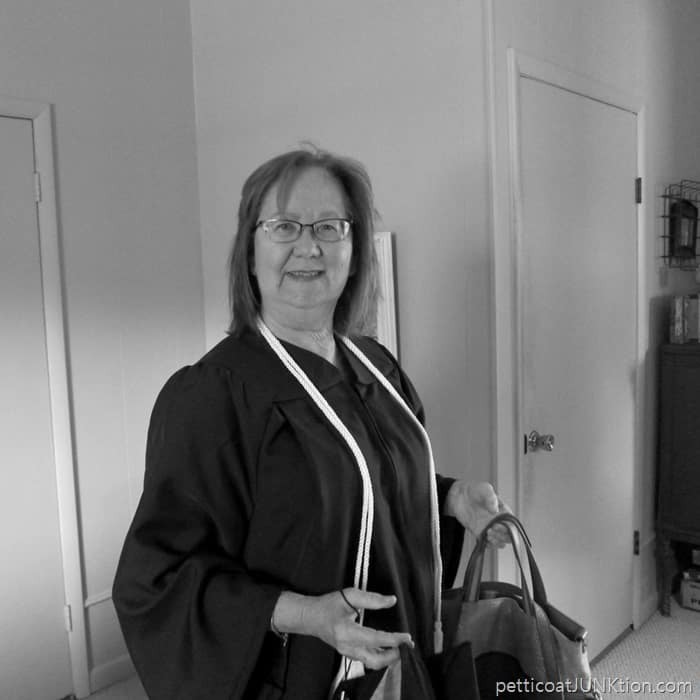 I graduated from college on May sixth….finally. I have a BS in Computer Science and Information Systems, majors in Database Administration and Internet & Web Technology. I have the degree but not sure I can do the work. Sounds weird huh. You know what I mean. I don’t think you really know how to do a job until you go to work and learn how to do it. It’s called on the job training. Not sure what I’m going to do since I will turn 62 in a couple of months. I may do nothing. Enough about me. Let’s talk about the cute little birdhouse. I painted the birdhouse when I was at Plaid Headquarters in March. 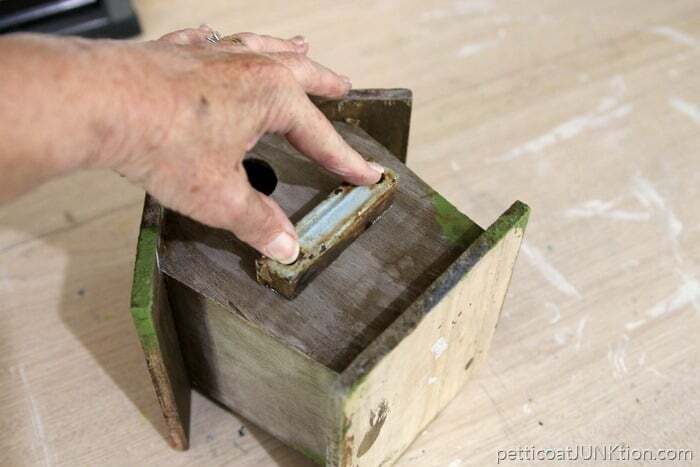 It was an unfinished birdhouse, the kind you buy at your local hobby store. All of the Plaid Creators painted birdhouses. We used several new products and you can see how each of us put our own spin on the project. That’s mine top right…the coolest one. You know me. I had to add a few details to mine after I got it home. I went through my hardware stash and found a couple of neat pieces that would add charm and whimsy to the house. 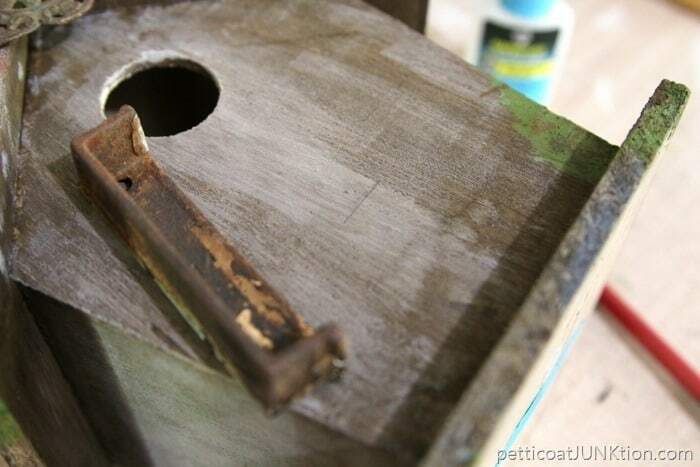 I nailed an antique drawer pull to the front of the roof thingy (technical term) then covered the shiny nail head with brown paint. The “perch” piece had to be glued on and I marked the placement lightly with a pencil. Usually I just eyeball stuff and stick it on there. 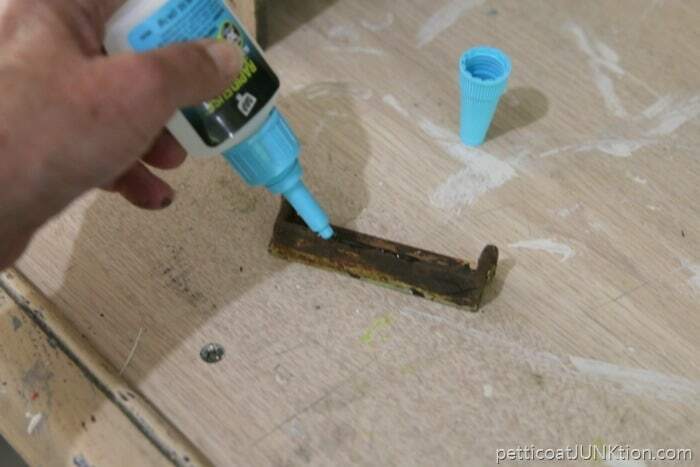 Then I put a few drops of Dap RapidFuse on the hardware…. ….. pressed it in place…and held for about 30 seconds….done! It does take a few hours for the Dap to cure completely so I didn’t go banging it around or anything. The addition of the two pieces to the birdhouse took about 10 minutes. So simple. 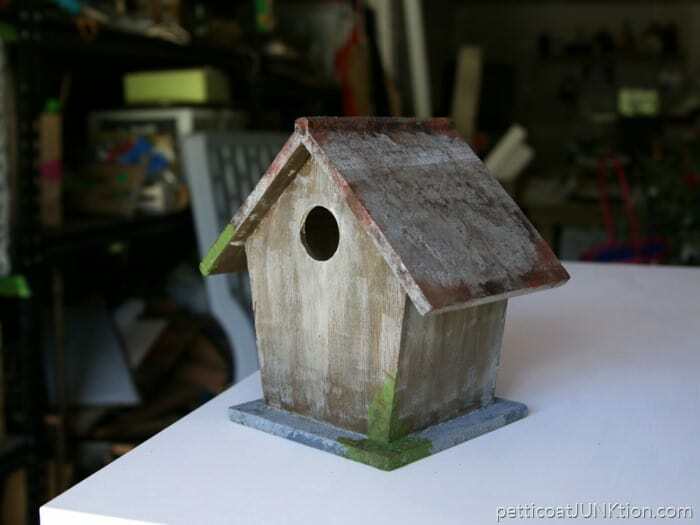 The result…..a charming little wood birdhouse. Just one pic of me on graduation day. The JTS took this photo before we left home for the ceremony. We headed out on vacation the next morning…traveling to Charleston, Savannah, and Tybee Island. I took a ton of photos (over 1000) and you guys get to see everyone of them. Just Kidding. I wouldn’t do that to you. I took photos of the cemeteries in Savannah, plantations in Charleston, and the beaches and cottages at Tybee Island. I’ll write a few posts and share photos over the next few weeks. You guys have to see the photos of the plantations….the aged painted wood on the interior walls of Drayton Hall had me drooling. Congratulations on your graduation!! I recently graduated as well!! 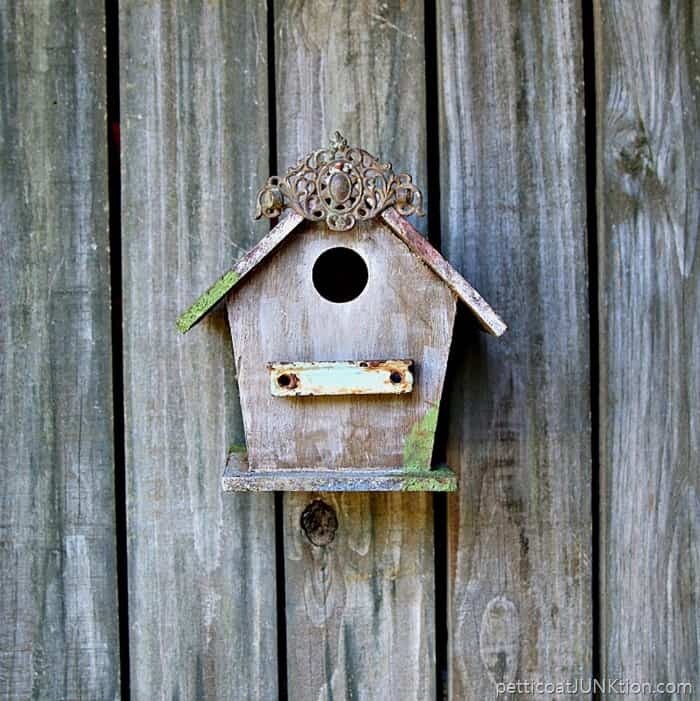 Thanks for sharing the bird house and how you made it with us over at the Welcome Home Wednesdays Link Party!! Congratulations on your graduation! Good for you, Kathy! Thanks for linking up to the Share it One More Time party ! Have a wonderful week! Yeah, get busy girl! Thanks for the comment. 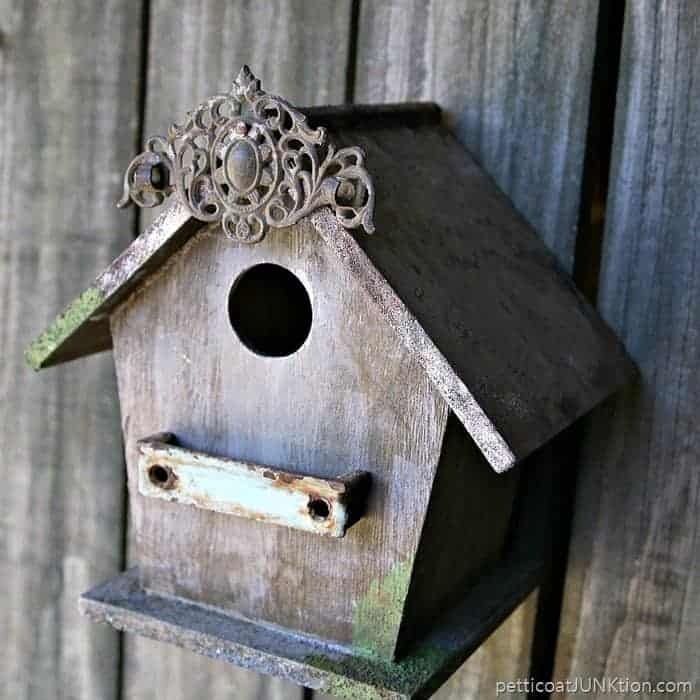 Congrats on your degree and your bird house looks great with a rustic look. Thank you for sharing with us at #HomeMattersParty .We would love to have you again next week. Congratulations on your graduation! You and your family must be so proud. I don’t know you personally, but I’m proud of you on this achievement! Congratulations on your graduation! What an accomplishment! Best Wishes! Congratulations on your accomplishment! Even if you never do anything wiht it, you completed and reached a goal! Be proud. I like how you dressed up the bird house. I love love your bird house ! So fun ! You are a inspiration ! Congratulations on your degree ! Congratulations on your graduation! You should be very proud of yourself; I occasionally take college courses working on a some day Bachelor’s degree, it is difficult to do working full time. Look forward to more projects, the bird house is great! Congratulations! Can’t wait to see your photos……as always! Congratulations to the Graduate! You go girl!!! I’m heading to Savannah next week. Can you give me a list of must sees? Your destinations were all the same as I would pick. Love Cemeteries! We’re staying at the Foley House. I’d love to hear your suggestions. The bird house is awesome, looks like a real old one. You did a great job aging it. Hey Joy! You will love Savannah. You definitely must see the Cathedral of St. John the Baptist and Bonaventure Cemetery. The Colonial cemetery near St John’s is nice but nothing compared to Bonaventure. Also go over to Tybee Island and visit the lighthouse. Places to eat….The Cotton Exchange on the Savannah River St. and A.J. Dockside Tybee! Have fun. Congrats on your graduation!! I will be turning 62 in a few months…you made us all look a bit better…even if you don’t use it….oh, and by the way, this bird house is darling! All this and college!!! Amazing!!! Congratulations on the degree! I’m a 56 year old with a math/comp sci degree – your degree gets you in the door, then you will learn as you go. Trust me, you *can* do it, if you want to 🙂 If I had the option to stay home and play with/make pretty stuff, that would be my choice, lol. But HUGE kudos for being another woman with a technical degree (the more of us the better, hehe). I look forward to seeing the Tybee Island pics, I’ve only ever seen photos (from Jane Coslick mostly) and I’m pretty sure I would LOVE it if I could visit. Congrats!!!!!!!!!!!!! I start my Masters this summer in Art. I too take pics of cemeteries….I’m obsessed!! Congratulations on your degree! I love you comment that you may do nothing! Having the degree as a personal accomplishment is enough. And, the birdhouse is adorable!!! Congratulations , an truly can’t wait for your pics !!!! Congratulations on your graduation! That is a wonderful accomplishment. I can’t wait to see your pictures. Those cities are some of my favorites and I love the plantations. Have visited that area a couple of times. You should be very proud. That is quite an accomplishment. I am just alittle older but wish I had finished my degree. I don’t think I will go back at this point as I am looking forward to retirement but by no means will I not be busy. I plan on doing a lot of painting and things I want to do like shopping for thrift items, etc. Congrats to you! Enjoy your blog!